Catholic News World : Wow Eucharistic Procession through Hollywood - Watch the Video - #Eucharistic #Adoration can Change the World! Wow Eucharistic Procession through Hollywood - Watch the Video - #Eucharistic #Adoration can Change the World! On the feast of Christ the King: 700 Hundred Catholics walked through Hollywood’s Walk of Fame in a beautiful Eucharistic procession for the poor. The event was organized by the Beloved Movement, which promotes discipleship and spiritual community. 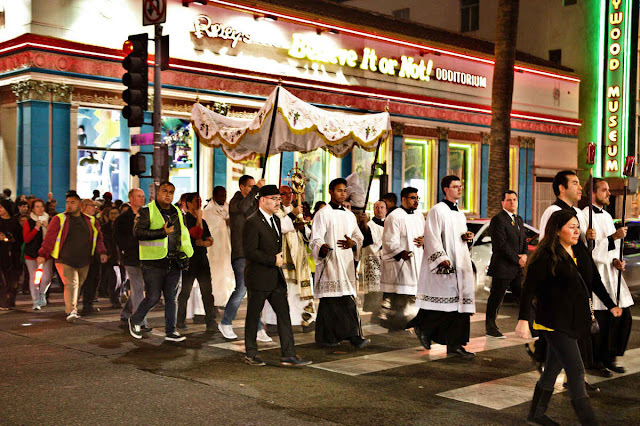 The Hollywood Beloved Procession occurred after Mass at Blessed Sacrament Church on Nov. 17. As part of the event, volunteers on the walk sat and listened to some of the city’s homeless population on the street. Seminarians from St. John’s Seminary and Queen of the Angels led the procession. It was also attended by members of several religious orders, including the Friars and Sisters of the Poor Jesus and Daughters of St. Paul. The procession ended in the church parking lot with adoration, praise and worship, and silent prayers.